Managing a small-to-midsized retail business often includes tracking, updating, and storing a lot of information. Spreadsheets filled with vendor pricing, co-op advertising submission forms, project documents, wireframes for a website redevelopment, and presentations are probably just a few examples of the documents the typical online merchant has stored on a computer hard drive somewhere. Keeping all of this virtual paper work updated can become even more difficult if the retail has telecommuting employees or co-workers who must exchange version after version of a report or other document via FTP, or worse, email. And finally, every one of these vital documents should be backed up to prevent loss due to any number of computer or real world failures. Google Docs is a free to use document suite, from one of the most trusted companies, that helps business owners and manager maintain files, spreadsheets, forms, text documents, and presentations, even allowing users across the country or the globe to simultaneously or individually update a single file. “The PEC Review” is my weekly column devoted to introducing you to the products or services that I believe may help you improve your ecommerce business. This week, let me show you why I think Google Docs is an excellent business suite. Google Docs provides a solution for spreadsheets, presentations, forms, word processing, and basic drawing; it covers all of the essential business suite functions. 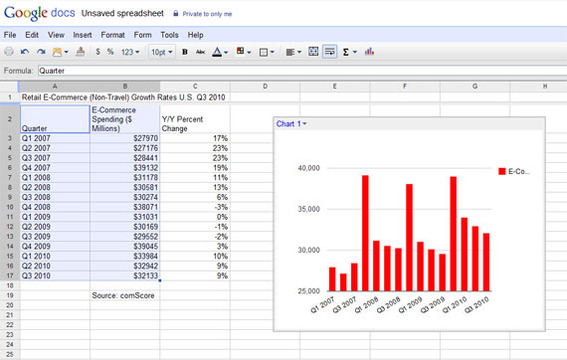 The Google Docs spreadsheet organizes data and can pull from external data sources, including Google Finance. The spreadsheet can be exported into popular formats, be published to a website, or can create dynamically updating charts. Google Docs spreadsheets including charting capabilities. The Google Docs word processing solution is more than adequate for composing business correspondence, writing product descriptions, or working up a post for your store’s blog. The Google Docs word processing solution provides all of the basic features an business owner or manager will likely need. Presentations can also be customized in Google Docs, although there are precious few font choices. 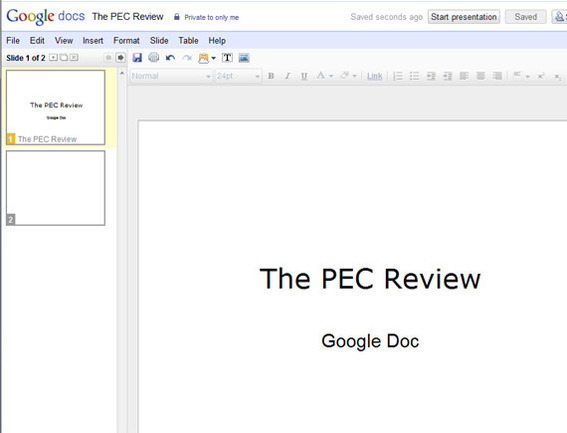 Google Docs even provides a basic presentation solution. 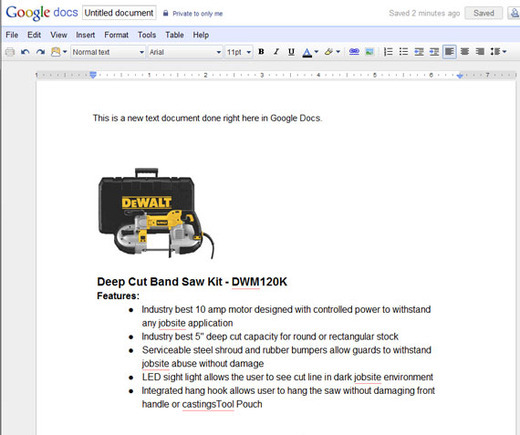 Google Docs allows up to 50 individuals to work on a single document at once. While this might sound somewhat chaotic, it can actually facilitate collaboration. I have been on the phone with a project member discussing changes to a document while each of us made real-time updates for the other to see. Likewise, it is possible to use the Google Docs drawing solution like a virtual whiteboard, which—in my opinion—works extremely well when combined with video conference, say via Skype. Google Docs will also track changes and provide version control for your shared documents. Sharing a document is as easy as sending the person you want to share with an email. The Google Docs service allows users to import all sorts of documents in a variety of formats, and likewise export all sorts of documents into a variety of popular business solution formats. Or $256 per year for 1TB. If you need even more storage, which is frankly a little hard to believe, Google offers additional pricing plans of up to 16TB.